What a Plant Knows: A Field Guide to the Senses by Daniel Chamovitz – Advanced – Only get this book if you already understand the basics of growing cannabis! Here at GrowWeedEasy.com, we are dedicated to providing the best information and resources on how to grow marijuana so that things are as easy as possible for you, the grower. In fact, we are dedicated to making our website the best marijuana grow bible in the world. The truth is, good marijuana grow guides can be hard to come by. That fact is actually the inspiration that caused us to create this website. We really believe that weed can be easy to grow, but you need the right information or plants can seem impossibly difficult to grow and finicky. However, we know that we cannot be everything to everyone and lots of people prefer hard-copy books! Even so, we still want to guide you to finding a reputable growing resource that works for you! There are many marijuana growing books out there, some are incredible marijuana grow bibles, while other marijuana grow books are little more than endless rambling. But which one is the best marijuana grow book? This is one of my favorite growing cannabis books. Ed Rosenthal has been teaching people how to grow marijuana for 40 years now, and it shows. He has a clean and measured approach to growing that I appreciate. He doesn't fall prey to hype, and I like that he doesn't seem to exaggerate. Unlike some of the other grow bibles, you don't get the feeling he's trying to sell anything except his knowledge. It's over 500 pages long, and has full color photos and clear illustrations about every topic. This book covers everything from the standard beginner's grow guide to much more advanced techniques. It has info about both indoors and outdoors, and all types of growing from soil to hydro. It's surprisingly comprehensive. This book is structured almost like a college textbook, with clearly defined sections full of pertinent and well-organized information. 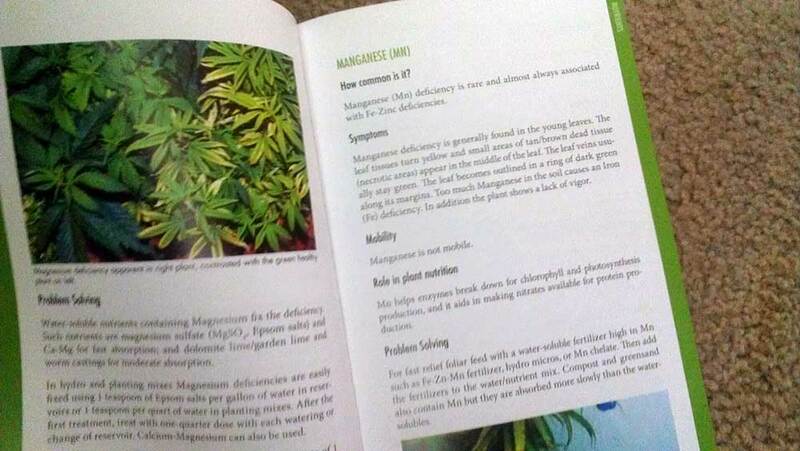 There is also a glossary at the back that has almost every keyword you can imagine, so you can look up a specific term like "foliar feeding" or "cloning" and be brought to the exact page. I actually still refer back to this book sometimes to get a second opinion, because the science is sound and Ed offers a uniquely experienced perspective on growing marijuana. Insider info: I know that Ed Rosenthal is currently in the process of writing a completely revamped and updated encyclopedia about growing, which should be released sometimes in early-to-mid 2017! This book is great, and you should still get it, but just know that a new one is coming! This book can be considered an "all-in-one" grow bible, but I'd say the one downside is the information leans more towards bigger gardens than smaller closet grows. Additionally, this book contains an extreme amount of information, which is what really qualifies it as an inclusive "marijuana growing handbook". However, because of this, if you're just getting started and only want to grow just a couple of plants, this grow book may be total information overload. This book by the legendary grower Jorge Cervantes is hands-down one of the most comprehensive marijuana growing books ever written… but is not necessarily meant for beginners. The newest version of this grow bible was published in 2006 and contains 512 full color pages with over 1100 full color photographs and illustrations. Though the book would be far shorter if they'd skipped the pages of ads. There are hundreds of incredible pictures of plants and buds are eye-candy for any grower, and I think these pictures really are what makes this book fun to flip through. There is so much information, and it's usually pretty easy to find what you're looking for. Even after buying several other grow books, none quite compares to the total comprehensiveness of this book. Now, I don't totally agree with everything Jorge says, especially when it comes to how he deals with bugs, but he does present the information in a way that leaves you able to come to your own conclusions. They should change the name of this book to "Grow Great Hydroponic Marijuana Indoors For Dummies" and everyone would know exactly what it's about. This book is not a comprehensive grow bible, yet it is definitely a complete and straightforward beginner's manual for those growing hydroponic weed indoors. If you feel like you have gaps in your knowledge of the basic process of growing, or if you want a simple, easy-to-understand guide to gently walk you through your first few grows, this book will serve you well. While this is a great guide for hydroponic grows (including coco coir and other soilless mediums) it doesn't have information about growing in soil. When it comes to grow lights, the author Logan Edwards focuses only on high intensity lights (which I also recommend but aren't right for everyone), and does not offer much information for those who want to use alternative grow lights like CFLs or LEDs. Topics include setting up your grow room, equipment, light schedules, grow room security, the life stages of marijuana, and the harvesting/curing process. One of the things people love and hate about this book is Logan Edwards chopped out most of the "behind-the-scenes" science of growing, so you're left with just what you need to know to successfully grow your crops. This simplification is perfect if you find other grow guides too complicated and want something simple, though the knowledge-hungry may want to learn more about what's going on down at the cellular level. Doesn't go very deep into the "science of growing marijuana" which can leave you hanging if you run into a problem (check out our picture problems guide if you run into any problems). In addition to the hard copy version, if you have a Kindle, Android phone, or iPhone and want to have this grow guide with you at all times, there's a kindle version available too. This book is unlike any other marijuana books on the market. 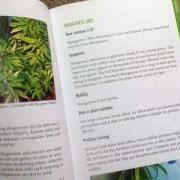 It's one of the first marijuana grow books I bought and definitely was a huge help! If you're just starting out, or even if you're an experienced grower, there's TONS of useful information and pictures in this slim little book. Definitely formatted like a handbook, you can quickly and easily find whatever it is you're looking for. While we offer a comprehensive guide to plant problems on our website, we know a lot of people prefer getting their information in book form. If that's what you're looking for, this contains detailed information on how to diagnose and fix most problems you may face while growing marijuana, whether you grow in water or soil, indoors or outdoors! So whether you have questions about…. This book has what you need in book form! This book is not technically about growing cannabis, though I highly, highly recommend that every grower read this book if they want to get a greater understanding of how plants grow and what makes them tick. I feel like I got more from this book than some of the other cannabis-specific growing books. If you've already got a grasp of the basics of growing cannabis, and want to expand your scientific knowledge of plants in general, this book is for you! The author, Daniel Chamovitz, Ph.D., is the director of the Manna Center for Plant Biosciences at Tel Aviv University. He has served as a visiting scientist at Yale University and at the Fred Hutchinson Cancer Research Center, and has lectured at universities around the world. His research has appeared in major scientific journals. The book debunks a lot of the common myths perpetrated about plants, including some of the famous experiments/results from The Secret Life of Plants. The books goes on to explain in detail how plants can "see" (how they sense and are affected by different types of light), what types of things they can "smell", how they sense / react to touch, and so on. Despite his very science-y background, the content of the book is presented in a very clear easy-to-understand way that is enjoyable to read. Even though the book is not about any particular plant (it focuses on plants in general) I learned quite a few pertinent facts that have already been helping me increase yields and plant health in my own garden. Plus it's just neat to understand why the plant is doing something! I know you are dedicated to growing the best marijuana possible or you wouldn't be reading this right now. As you probably know by now, marijuana plants are quite a bit more complex than a regular house plant, but learning how to grow isn't as crazy complicated as a lot of growers make it seem. Still, you need to learn this plant's language if you want to grow high-quality buds and get great yields. Or you can take the shortcut to consistently producing outstanding results by learning from real growers who have done all the work for you. Every experienced grower has their own grow style, and over time as you get exposed to more info, you will begin to finely tune your personal grow style. 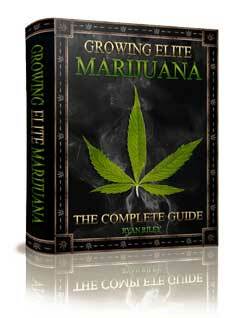 Now, there is a lot of great info in Ryan Riley's Growing Elite Marijuana book. If you read the entire thing from front to back, even a totally experienced grower will learn something, and probably a whole lot of things. For a beginner, this book has literally everything you will need to know. As you probably know, the growing forums can be a rough place to learn how to grow weed, You must be on the lookout for bad information and will always be second-guessing whether this or that person in the forums actually knows what they're talking about. That's why investing in growing books by known pros will pay off in the long run. I've read several marijuana books over the last decade (read some of my reviews about the best growing marijuana books), and learned a lot from all of them. Each book I've read has leveled up my growing skills. This book isn't for you if you're just looking to grow a small amount of buds to smoke a few times a year. Yet if you're a daily smoker like me and are dedicated to growing a constant supply of buds for as cheap and easy as possible, you'll be glad you invested in Ryan Riley's ultimate guide to growing. More Best Marijuana Grow Bible and Other Growing Book Reviews coming soon! How long will it take to grow weed? What grow lights should I get?